I am sure you have seen the PSA ads for your brain on drugs. This week my Throwback Thursday went back to 2013 and getting ready for Quilt Market making a last minute bag using a last minute pattern by Sew Sweetness. When I was posting the photo of the block used in all of its beauty and symmetry, the 80's PSA popped into my head of my brain before fabric and after fabric. It was chaos before the block was made but after it was so stunning! Absolutely! 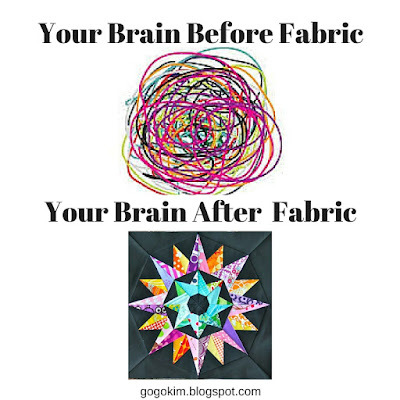 And I love that quilt block! A bee member made it for me and I have it in one of my favourite quilts! And strangely it popped up on my Pinterest board the other day too! This is hilarious! But true! Such cute wording. These -- and others from the last couple of days -- need to be made up as printable so and then framed for my sewing room! Jeannie, I did not think of that! I will get on this great idea in the next couple of weeks...THANK YOU!